The reliable water source provided by Gihon Spring was important to Jerusalem’s early development. The Gihon Spring was the main source of water for the city of Jerusalem from its founding more than 5,000 years ago until the 20th century. In Hebrew, 'gihon' is a derivative of 'gushing'—which the spring continues to do for tourists today. This particular channel of the Gihon is called Hezekiah's Tunnel after the king who oversaw its construction in 701 BCE. Photograph by Tamar Hayardeni, courtesy Wikimedia. This file is licensed under the Creative Commons Attribution-ShareAlike 3.0 Unported License. Jerusalem, Israel, is one of the oldest continuously inhabited cities in the world, and a holy place for the Jewish, Christian and Muslim religions. The oldest part of Jerusalem, known as the City of David, owes its development to an important geologic feature: a freshwater source called the Gihon Spring. Originating at the base of the hill on which the City of David was constructed, the Gihon Spring’s waters emerge from a cave on the city’s eastern slope before flowing into the adjacent Kidron Valley. Professor Rehav Rubin, who teaches geography at the Hebrew University of Jerusalem, explains how the spring’s geography helped determine its name. Since Jerusalem is located in a region without many water sources, the spring proved instrumental to the city’s early development. Though the Gihon Spring was what Rubin calls “the most important key factor” to the ancient city’s location, another geographic element also proved important. Together, Rubin says, the hill and the spring guided Jerusalem’s emergence as an urban center. The Gihon Spring is located outside the ancient city’s walls. Early residents had to build tunnels to access their water supply when the city was under siege. The earliest of these waterworks is Warren’s Shaft—named after British engineer Sir Charles Warren, who discovered the subterranean water system in 1867. The entrance to Warren’s Shaft is found within the walled portion of the City of David. It is a rock-cut tunnel 41 meters (135 feet) long and has a vertical shaft at its eastern end. The shaft descends 13 meters (42 feet) into the waters of the Gihon Spring. Water could be drawn using a container on a rope. This made it possible for residents to attain water without having to leave the protection of the city walls. The S-shaped tunnel is 533 meters (1,749 feet) long and winds beneath the City of David to connect the spring with a less-vulnerable area of the city. Scientists are not sure why the tunnel curves instead of traveling in a straight line. Some think that workmen might have cut the tunnel to follow naturally curving rock formations, while another theory suggests that ancient engineers might have simply worked to expand a pre-existing crack they discovered into the tunnel. The Gihon Spring was used by Jerusalem residents throughout the 20th century. Jerusalem currently gets its water from the area around Rosh Ha-Ain, about 40 kilometers (25 miles) northwest of the city. Even though the Gihon Spring is no longer vital to the survival of the city, the spring’s subterranean water tunnels are a popular tourist attraction in Jerusalem. The Gihon Spring has been gushing for more than 5,000 years. The Pool of Siloam, a freshwater reservoir fed by Hezekiah’s Tunnel with Gihon Spring water, is the reputed site where Jesus cured a blind man. underground chamber that opens to the surface. Cave entrances can be on land or in water. word that is based on (derived) from another word. 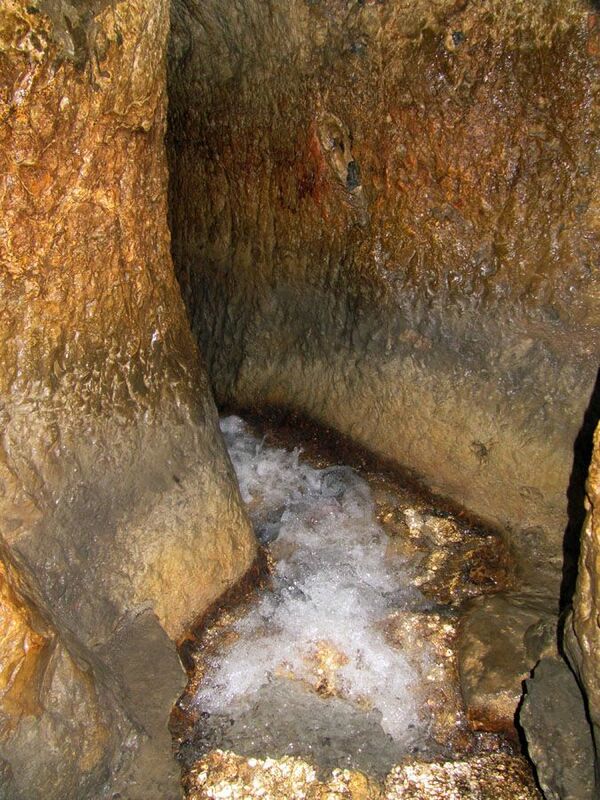 source of water flowing beneath the oldest neighborhood (City of David) in Jerusalem, Israel. having to do with the religion or culture of people tracing their ancestry to the ancient Middle East and the spiritual leaders Abraham, Isaac, and Jacob. having to do with Islam, the religion based on the words and philosophy of the prophet Mohammed. a system of spiritual or supernatural belief. organized attack on a fortified or protected structure. pipe or tube with two legs of unequal length, usually ∩-shaped, used to transport water or other fluids over elevations. beginning of a stream, river, or other flow of water. small flow of water flowing naturally from an underground water source.